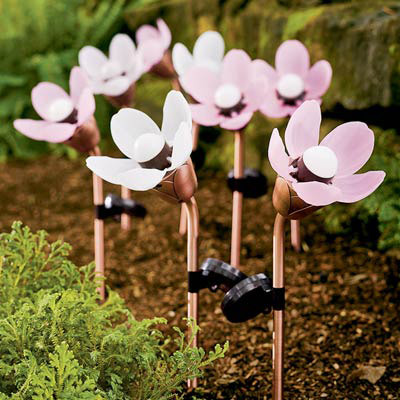 There are a great deal of garden lights to choose from if you’re searching for something to add to your plants. The Blossoming Garden Solar Light absorbs solar power like most outdoor lights, but it it uses up all of that power for more than the LED light. This motorized flower blooms every single morning and closes up at night. There is a very small solar panel attached to the bottom of the stem. The panels charge up the rechargeable batteries. They then in turn power the LED light and flower petals that automatically open and close. The stem itself is metal with a bright bronze finish and the whole thing stands 16 and ½ inches tall. When you purchase the light you’ll get to choose between pink or white petals. The unfortunate thing is that these are sold individually instead of in sets. Which means you might want to choose these $34.95 lights for accents used sparingly. Solar lamps are fabulous for all areas inside and outside. I particularly like using them for lighting the walkways in and around the house and garden! These lights are really cool, but I can’t imagine they’re particularly bright?